What do you ENJOY? Post a picture and win! I'm sure several of you have heard of Enjoy Philippines in the past. 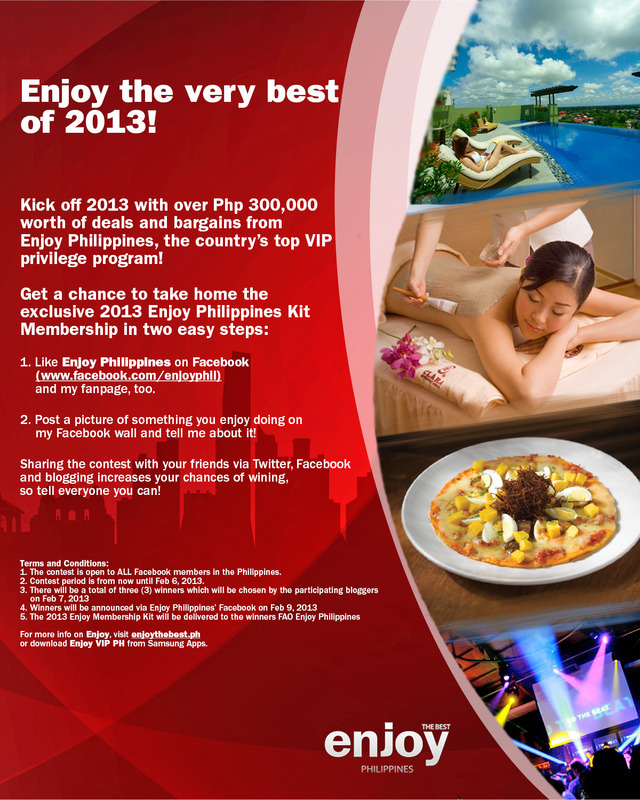 For the benefit of those of who haven't, Enjoy is the Philippines' premiere loyalty and privilege marketing program. The Enjoy Philippines kit allows one to enjoy over Php300,000 worth of deals at the country's top establishments for only Php1,995 per kit. With discounts every single day of the week for places in Manila, Cebu, Boracay, and Shanghai, it's really a great buy! Imagine, you can get a free upsize from the likes of Fruit Magic and Coffee Bean every single day, a 10% discount on purchases at Digital Walker and Digital Hub, and a lot more! This 2013, Glich's Life has partnered with Enjoy Philippines to celebrate life with whatever you enjoy the most. We love it when people share things with us! We're giving away 3 Enjoy Philippines kit to lucky winners. It's very easy to join! You'll need your creative juices flowing. Check out the steps below. This contest is open to all Facebook users within the Philippines. It runs until February 6, 2013. What are you waiting for? Snap and post now! Remember, the key thing that we want to see here are pictures of what you enjoy. Hi there! You were referred to me by a friend. Re-website and blogging. I hope I can converse with you about this. I don't know ur number so I just decided to msg you here. My nnumber is 09396348191. Pls do .txt me and I will call you. Btw, my name is Dr. Joanna Villadolid-Cristi . You can check verify me in Facebook. Just don't post this iinfo here. Thanks. Hope to win! more power. Hi I dunno if u got my msg but this re:website and blog. I'm a friend of Dr. Dominic Sevilla. Thanks.